A shift from a task-focused institutional approach to care, to a transformative model guided by each resident’s interests, feelings and emotions has seen increased resident morale and an enhanced sense of inclusion. In July, Salvation Army Aged Care Plus adopted the internationally awarded ‘Butterfly Household Care Model’ in two of its residential aged care centres, Cairns Aged Care Plus Centre at Chapel Hill, Queensland and Mountain View Aged Care Plus Centre at Narrabundah, ACT. 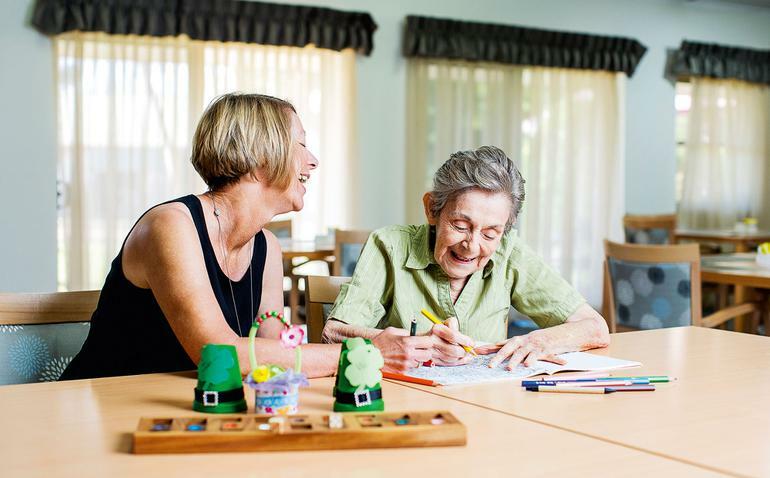 Originally pioneered in the United Kingdom by Dementia Care Matters, the Butterfly Household Care Model has made ground-breaking advances in the UK and Ireland in providing person-friendly dementia care. The first three months of implementation has seen the reorganisation of residents living with dementia. They are now living with those experiencing the same level of dementia. In this reorganisation, a resident at The Cairns Aged Care Plus Centre at Chapel Hill moved to a room with a view of the lake. Carers report she is now more engaged with her fellow residents and is always inviting people to visit her room. “The moving of my room to one overlooking the lake is wonderful. I may need to get a bathing suit!” says the resident. A no uniform policy has also been introduced, with employees now wearing everyday wear to work. Centre Manager at The Cairns Aged Care Plus Centre at Chapel Hill, Ms. Tania da Fonseca says the ‘Butterfly Household Care Model’ in action means the daily routines of people living with dementia have given way to a relaxed, unscheduled day allowing residents to engage in the activities they actually want to do. “The holistic care model is about so much more than physical changes, it also addresses the emotional and spiritual needs of the resident living with dementia as carers tailor the resident’s daily routine to suit their individual needs. "Observing the response and impact of a change as simple as introducing a no uniform policy has been tremendously encouraging and a sign of the progress we can expect as implementation continues. I can already see that these changes have relaxed the atmosphere and sparked colourful conversations between residents and carers,” she says. Aged Care Plus Executive Manager – Care Services, Peter says he is delighted to see such significant improvements this early into the model’s implementation. “Our residents are an extension of our family. The improved relationships we have observed in response to changes implemented so far has been phenomenal, especially when we are this early into the project. This is a direct result of the training and improved engagement of our staff, who are focused on enhancing each moment for all of our residents,” Mr Bewert says. The Salvation Army Aged Care Plus was selected as one of only two aged care providers in Australia to launch the ‘Butterfly Household Care Model’. Aged Care Plus is also the first provider in Australia and internationally to introduce this model of care in the Community Care Setting.